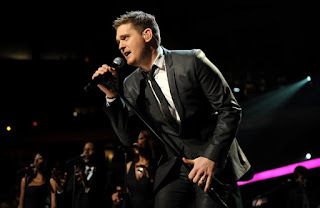 Singer Michael Bublé will return to St. Louis for the first time in more than five years for a concert at 8:00 p.m. Friday, March 22 at the Enterprise Center. Bublé (pictured) last performed here in September 2013, when the same venue still was called the Scottrade Center. He recently made headlines for an interview in which he discussed his five-year-old son Noah's battle with cancer and his possible retirement from the music business. That talk of retirement then was walked back by his representatives almost immediately, as the singer prepares to launch a tour in support of his upcoming album Love, which will be released next Friday, November 16. Tickets for Michael Bublé are priced from $65 to $135 and will go on sale at 10:00 a.m. Monday, November 19 via Ticketmaster and the Enterprise Center box office.